Satisfying, pen-and-paper-style zombie storytelling that's somewhat blandly presented and burdened by bugs. A worthy RPG that would've benefited from more budget. What is it? A turn-based zombie RPG in the style of Fallout 2 or Jagged Alliance. My best day in Dead State was also my worst day. On a single scavenging trip, I’d found three consecutive fruit groves: tomatoes, oranges, and apples. It was a huge haul of non-preserved food, one of the hardest things to come by in Dead State’s apoco-sandbox. The same afternoon I recruited a new ally, an ex-con with mechanical skills, and scored nine whole gallons of gasoline, enough to keep our generators going for two more days. I’d also found my first compound bow, a ranged weapon with replenishable ammo. Returning to my shelter that night, the survivors back home had finished building a wooden fence, giving us a better layer of protection against zombies and bandits. The next morning, someone else in my group pulled me into a room and shot me. Despite yesterday’s victory, morale in the shelter had cratered over the past week, and they’d had enough of my poor leadership. Game over. 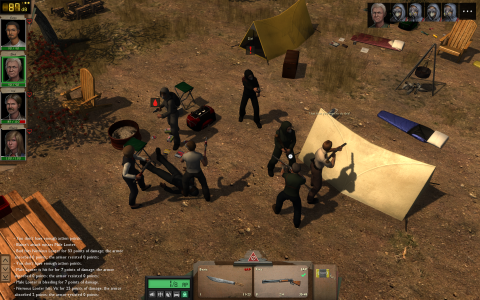 Dead State captures the struggle of rescuing and then looking after a group of variously helpful and troublesome people in the zombie apocalypse. Holed up inside a high school, your goal is keeping these folks safe, fed, supplied with weapons, in good spirits, and keeping them from killing each other or killing you. You wade out into Dead State’s mangled Texas to gather supplies in a turn-based combat system similar to Fallout 2 or XCOM. Everything you scavenge, sometimes at the cost of party members’ lives, goes toward keeping others alive. This sums to Dead State being one of the best “campaign” games on PC—on par with Xenonauts or the recent XCOMs as single-player experiences where you struggle toward a finish line that you’re trying to get as many people as possible across. But Dead State is also more flawed than these games: bugs, crashes, and engine quirks add a layer of technical struggle atop the story’s. These issues hurt the game’s rhythm—I found myself quicksaving aggressively out of paranoia that I’d encounter a crash. There are also areas where Dead State’s budget feels too modest for its ambitious scale. Still, this is a memorable and unabashedly PC RPG, admirable in its openness. I love the way that Dead State tabulates the progress of my fledgling survivor group, almost in the style of a tycoon game. Each day terminates with a score screen that tallies morale, food, medicine, and gasoline income and deductions. This apocalyptic Excel sheet prompts you to set your own goals: if food’s low, I set out the next morning to see how many fish I could catch at a lake, or knock over a supermarket, or take some party members off guard duty (endangering the shelter’s protective fence) to build a permanent, food-generating shelter upgrade, like a garden. There isn’t a great variety of activities in Dead State—its verbs mostly amount to kill, explore, loot, talk, and build—but I always felt like I had complete agency over which problem I wanted to solve and how to solve it. From the moment you exit the shelter, for example, no part of the world is cordoned off. Party characters do provide some tasks for you to tackle inside that sandbox. Anita, an ex-trucker, asked me to find a medical dictionary so that her daughter Renee could improve her healing skill. Vic, one of the cops in my party, told me to visit a police camp and gave me unique dialogue options when I chose to bring him along. These people also come into conflict with one another, depending on who you let into the shelter and who’s left alive. The preacher that I took in, for example, contributed to morale on a daily basis, but when I also gave refuge to a brash biker character (who’s a terrific asset in combat), she started harassing him and I had to step in to mediate. These social interactions and Dead State’s story come to a head during “crisis events,” pivotal plot moments in the campaign where party members take sides on issues. When the shelter couldn’t agree whether or not to spend labor and valuable resources to investigate an issue with our water system, I decided to invest as little as possible in solving the problem. A compromise. This weak decision actually upset everyone, damaging morale. But hey, I’d saved some construction parts for other projects, right? Navigating individual character politics while working toward the greater good makes for interesting moral gymnastics—I later bribed the biker character by letting her take some stuff storage in exchange for her support during the next crisis event. As a party member yourself, Dead State gives you a good spectrum of dialogue to pick from, letting you play as a no-nonsense, ruthless slave driver or an understanding, perhaps too-forgiving appeaser. I leaned toward the latter on my first playthrough, and I love that Dead State punished me for it—my “the more, the merrier” policy meant there were more hands for labor and combat, but also that there were more people butting heads. It was much harder to keep everyone happy, and my morale was slipping. At one point I considered taking a chronically depressed, morale-eroding party member into the field and getting them killed just to alleviate the situation. At another point a different depressed character did me a favor by killing themselves. Outside scripted events and interactions, though, the shelter stagnates. It’s an area where I felt the limited reach of Dead State’s budget. Party members operate essentially as static dialogue dispensers. They each have a small amount of personal lore you can plug them for while talking in the shelter, but otherwise all you can do is bribe them with unique luxury items (like deodorant, coffee beans, or batteries) to improve their mood. I wish these characters were more expressive within the shelter itself. Far more of your time in Dead State is spent stabbing, bludgeoning, and shooting than talking, though. The combat adopts a standard turn-based template, with AP consumed for each move, reload, or attack a character performs. The balance of it is surprisingly good given the size and varied layout of Dead State’s isometric maps, a few of which are so big that they might take an hour or more to clear. I particularly like the way melee weapons have different utility attacks. In addition to a basic attack, shovels have a higher-cost knockdown attack, for example. Knives have a chance to counterattack. Wrenches and axes can cripple zombies, preventing them from attacking. A sledgehammer and baseball bat can attack diagonally. This asymmetry, combined with character-specific weapon proficiencies, made the process of gearing up satisfyingly deliberate. What wore on me, though, was how tedious zombie-killing became after 10 or so hours. Zombies are completely static unless you or an NPC are making noise (by bashing a locked door, for example) or if you enter their line of sight. Once I got a hang of the combat, areas that only held zombies became a cinch to clear because a skilled melee character with the right weapon can kill a zombie in a single round. Combat is satisfyingly chaotic when more than two factions are involved. I also had to restrain myself at some points from exploiting Dead State’s noise mechanic, which is extremely effective in some situations. On a snack cake factory map, I lit a single firecracker and lured away every violent biker away from their post, then I looted the interior without a scratch. Combat is satisfyingly chaotic when more than two factions are involved, however, and there are points where I liked using noise creatively. In a shopping mall, I wanted to break into a corner of the map that armed looters had barricaded. Knocking on their only entrance would’ve gotten me killed, so I outsourced my siegework to zombies, making noise with my firearms to put them in the looter’s line of sight. This stimulated a fight, thinning both sides enough for me to move in. I enjoyed grappling with Dead State, but it fought me plenty along the way. Crashes to desktop—more than a dozen in 51 hours—cropped up at various points on two different PCs. I also experienced sluggish performance on some zombie-heavy maps, where Dead State dragged on for needless tens of seconds each combat round as it pondered which chess moves the undead should make. There were other, ancillary issues too. One game location, a motel and gas station, was permanently in turn-based mode whether or not I was in combat, making it a tedious chore to navigate. Walls would also occasionally become see-through, letting me get an unfair glimpse at the threat inside before entering. After recruiting a cat to my team, Dead State loaded me into a black screen the next day, an issue I had to load a previous save to work around. I was disappointed that I never had to use antibiotics, a consumable item, to manage infected characters’ health. I’m not sure if that was a bug, luck or bad balance. Those issues aside, the biggest design sin is how static the shelter feels. I like that completed upgrades are visible in the shelter, but the limitation of Dead State’s animation is transparent here. New characters simply stand like statues in the same area throughout the campaign, preventing the shelter from feeling more like a lived-in, evolving space, and you from developing a stronger relationship with Dead State’s centerpiece. Dead State gets far on the strength of its writing and its pen-and-paper spirit. Its slice of Texas is dotted with busted gas stations, restaurants, and offices that are fun to comb for loot. The game’s technical flaws are a burden to the player, and simple zombie behavior eventually dulls the tension of fighting the undead. Still, what it offers as an RPG—grounded survival drama, tough character conflicts, and generally good turn-based combat—is rare enough to make it worth playing.